Do you need a website for your business? Here’s the thing: a website is not essential to run a business, but it will make a huge difference to your success in business to have one. However, even if you do get a robust hosting account, create an attractive website with relative ease, and optimize it for search engine traffic, you might not get as far ahead these days as you would have in the early years of the Internet. Since the turn of the century, savvy business people have realized the enormous benefits of having a website, regardless of a businesses’ audience, size or business model. So what do you have to do to get noticed when it’s become increasingly crowded on the Web? It’s simple, create a superior website, and do what most websites are not willing to do in order to stand out. When choosing a website template, focus on developing a harmony of parts. A good website is based on a variety of things working together to create an attractive design and easy navigation. It’s about symbiosis rather than stunning the visitor with a firework display of rapidly moving graphics. It’s about building a website that is greater than the sum of its parts. If you want to start your own website and you’re not that good at coding, you may want to look for some free HTML/CSS templates on the web. We’ve done the hard work for you and found 10 really beautiful and high-quality free HTML templates. If you are looking for free HTML/CSS templates to practice your skills, this 10 high quality, hand picked templates are just perfect for you. 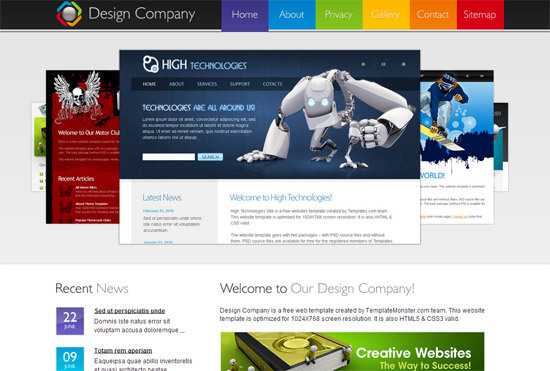 They have fresh and appealing designs and are very well coded. Check them out! The first example is perfect for a photographer’s website. Photographers can use some of their greatest photos in a large horizontal slider followed by a nice horizontal band on which they can tell more about themselves and their passion. On top of this, this template also provides a nice grid gallery with large thumbnails. 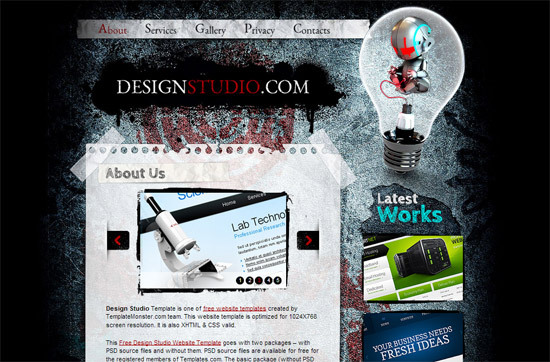 This template also has a responsive design which will make the website look great on any device possible. Have a look and see if this is the template you have been looking for. And if you are looking for a much more simple and clean design then this template might be exactly what you have been looking for. 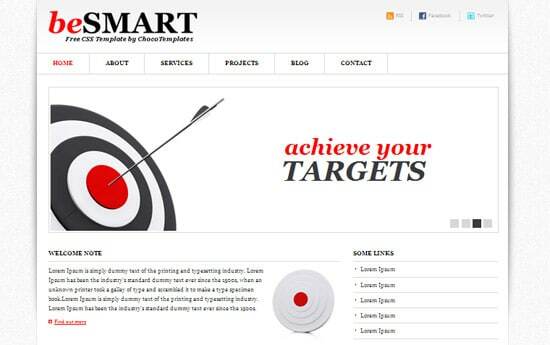 BeSmart is a free CSS template with a simple design. The colour palette is made out of whites, greys and red as an accent colour. The slider on the homepage is simple, yet effective. White space, also known as negative space, is the best way to make copy readable and to cleanly separate it from graphics and advertisements. It’s something you only notice when it’s not there. When it’s not there, everything is crowded and difficult to read. This is a great example of how to use white space perfectly. This example is perfect if you are working on a business card website. Cardex is a free HTML/CSS template, ideal as a vCard website. This can be used as an online CV or mini-portfolio. It has large, 3D icons and a crafty touch. This free HTML template uses unique fonts in its design. Typography is all about the art of type. Use minimally and tastefully. Understanding typography rules is a study in itself, and it includes mastering essentials like font stacks (basic CSS), measure (length of lines), leading (height of lines), and hanging quotes and bullets (improve readability). 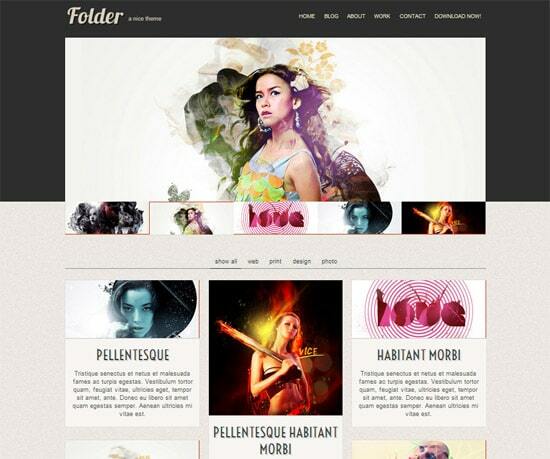 Folder is a responsive HTML 5 template that adapts to any devices and browser sizes. Perfect for creative showcases and business. 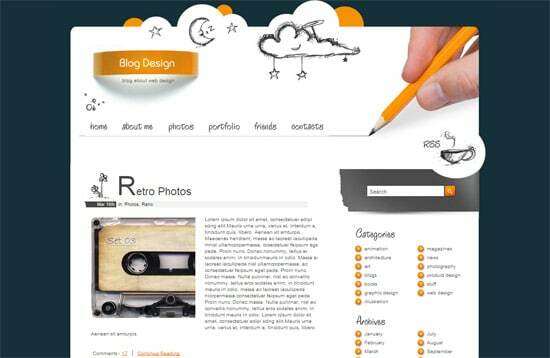 This template’s retro and minimal design gives importance to the content and gives a friendly air to the visitors. It uses a dark grey for the upper part of the website and a lighter grey texture for the rest of the website. Grids are the horizontal and vertical separations on a web page to break it up into distinct chunks or sections. It, too, needs to be balanced out to be easy to the eye and this template uses the grid portfolio layout masterfully. It might be a great asset to your templates arsenal and can come in really handy for future projects. Save yourself a great deal of time by using this amazing template. This is a great, free blog template which can come in really handy if you are looking to make a really good looking blog. You can create an awesome blog with this template. It creates a crafty, friendly atmosphere and the hand-drawn elements are a nice touch. You should definitely add this template to your freebies arsenal because it can come in really handy for future projects. Graphics should be well-balanced in terms of size, color, and content and this template is a great example of how to use graphics to your advantage. While they don’t have to be stunning to make a good website, you have to avoid bad graphics, which will definitely ruin the look and feel of a website. If you have some big, bold graphics, you need to balance them out with some understated ones as well. This is a grungy free HTML/CSS template you can download and modify as you please. It has a dark theme and interesting vector elements which make the design layout unique. The page texture looks great and can be easily used as a portfolio or for posting articles on regular basis. You will definitely save yourself a great deal of time with this amazing free template. If you are working on a site and you want to make an audience curious about what the future website is about to look like, then this template might definitely come in handy. It has a simple dark background which will let followers know exactly how things are going in the design process. 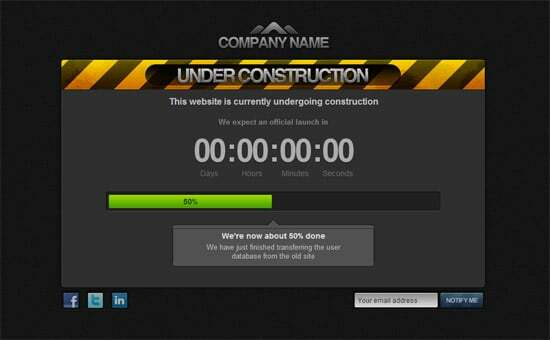 This is a simple and modern Under Construction template made in HTML/CSS. It is free to download and use as you please. If you have a hosting company and want to design your website fast, you can choose this theme and tweak it a bit to suit your brand. It has a great design and can be easily modified to suit your preferences. 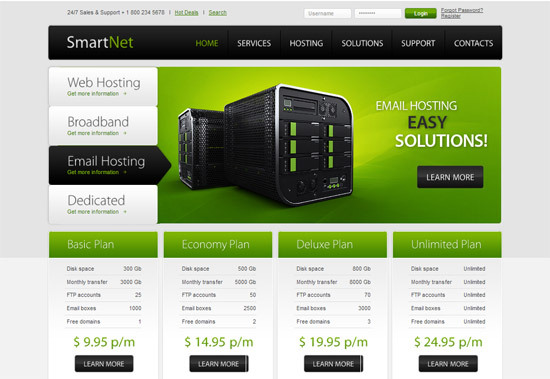 The Free Hosting theme can come in really thanks to its simple and clean design that can easily be personalized as you please. A good website template also has balance between gra[hics and texts. Balance is about making sure that all the elements are evenly distributed. For instance, you don’t want to just have text on one side and only graphics on the other side. Even if you have a simple web page with a right sidebar, there should be some pictures in the articles section and some text in the graphics-intensive sidebar section. This template can save you a great deal of time! If you are looking for an awesome template with a cool design than Design Company template is definitely the one you have been looking for. This is a free template for a design company. It has a colourful design with an interesting slider on which you can post some really cool banners, perfect for showcasing the company’s latest work. Color is about color coordination. You don’t want too many colors or too few. You also want the colors to play well together and not clash. And, of course, you want to avoid glaring bright colors that totally distract the visitor from the contents on a website. This is not to suggest that all colors need to be muted. A few bright colors here and there can be added—so long as there is some kind of color coordination. Save yourself a great deal of time with this template! 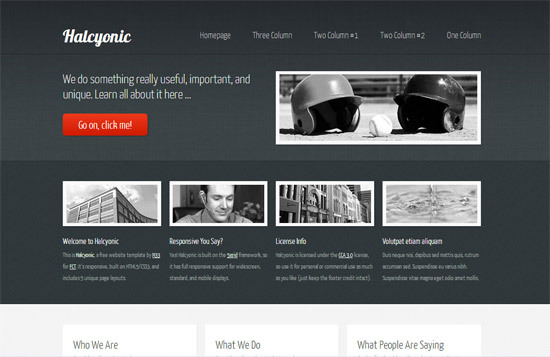 This is Halcyonic, a free site template by AJ forHTML5 UP. 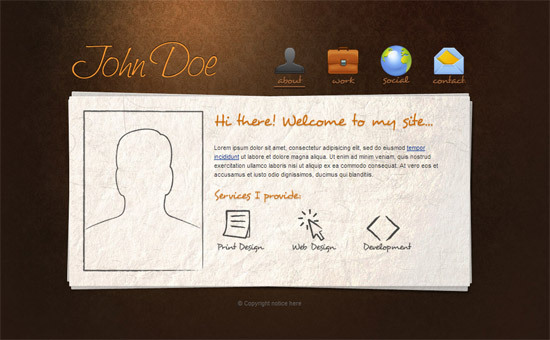 It’s responsive, built on HTML5 + CSS3, and includes 5 unique page layouts. Halcyonic is built on the skelJS framework, so it has full responsive support for desktop, tablet, and mobile device displays. 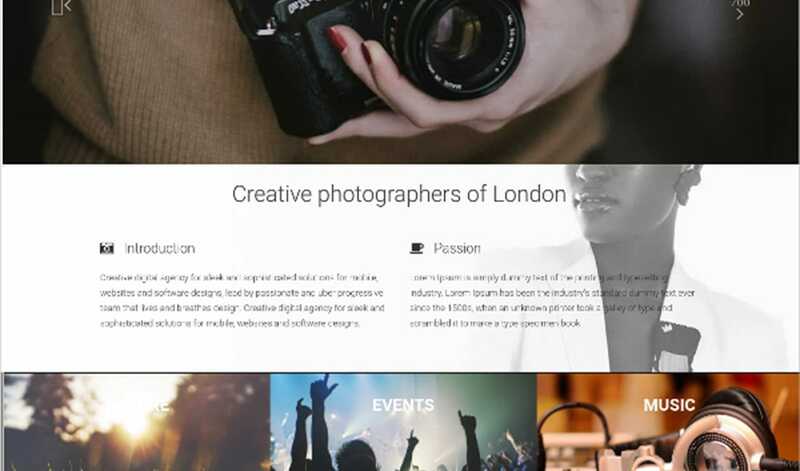 The design layout uses horizontal bands on which you can add content and customize in any way you see fit. The textures the background uses make buttons, typography and photos stand out, making your website look really neat and clean. Neither you nor your staff has to be there in person to talk to customers, close sales, accept payments, and deliver products because all these things can be automated. You will be open for business around the clock every day of the year. Customers from all over the world can get to know more about your business, its products and services, at their convenience. Your website will also enable you to expand your reach across the Internet in many ways. For instance, you will be able to expand your influence via video-sharing on YouTube, get more effective advertising via Google and Facebook, and understand your customers better via online surveys. I love design company! Great templates. Thank you!